While engaged with the brahmanas who were too much involved in the performance of Vedic sacrifices, Krishna and Balarama also saw that the cowherd men were preparing a similar sacrifice in order to pacify Indra, the King of heaven, who is responsible for supplying water. As stated in the Caitanya-caritamrita, a devotee of Krishna has strong and firm faith in the understanding that if he is simply engaged in Krishna consciousness and Krishna’s transcendental loving service, then he is freed from all other obligations. A pure devotee of Lord Krishna doesn’t have to perform any of the ritualistic functions enjoined in the Vedas; nor is he required to worship any demigods. Being a devotee of Lord Krishna, one is understood to have performed all kinds of Vedic rituals and all kinds of worship to the demigods. One does not develop devotional service for Krishna by performing the Vedic ritualistic ceremonies or worshiping the demigods, but it should be understood that one who is engaged fully in the service of the Lord has already fulfilled all Vedic injunctions. In order to stop all such activities by His devotees, Krishna wanted to firmly establish exclusive devotional service during His presence in Vrindavana. Because He is the omniscient Personality of Godhead, Krishna knew that the cowherd men were preparing for the Indra sacrifice, but as a matter of etiquette He began to inquire with great honor and submission from elder personalities like Maharaja Nanda. After hearing this, Krishna, the Supreme Personality of Godhead, in the presence of His father and all the elder cowherd men of Vrindavana, spoke in such a way as to make heavenly King Indra very angry. He suggested that they forgo the sacrifice. His reasons for discouraging the sacrifice performed to please Indra were twofold. First, as stated in the Bhagavad-gita, there is no need to worship the demigods for any material advancement; all results derived from worshiping the demigods are simply temporary, and only those who are less intelligent are interested in temporary results. Second, whatever temporary result one derives from worshiping the demigods is actually granted by the permission of the Supreme Personality of Godhead. It is clearly stated in the Bhagavad-gita: mayaiva vihitan hi tan. Whatever benefit is supposed to be derived from the demigods is actually bestowed by the Supreme Personality of Godhead. Without the permission of the Supreme Personality of Godhead, one cannot bestow any benefit upon others. But sometimes the demigods become puffed up by the influence of material nature; thinking themselves all in all, they forget the supremacy of the Personality of Godhead. In Srimad-Bhagavatam it is clearly stated that in this instance Krishna wanted to make King Indra angry. Krishna’s advent was especially meant for the annihilation of the demons and protection of the devotees. King Indra was certainly a devotee, not a demon, but because he was puffed up, Krishna wanted to teach him a lesson. 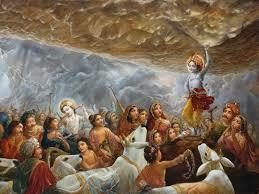 He first made Indra angry by stopping the Indra-puja, which had been arranged by the cowherd men in Vrindavana. Maharaja Nanda and other elder members argued that without satisfying the predominating god one cannot derive any good result simply by material activities. This is actually the fact. For example, it is sometimes found that in spite of first-class medical help and treatment by a first-class physician, a diseased person dies. It is concluded, therefore, that first-class medical treatment or the attempts of a first-class physician are not in themselves the cause for curing a patient; there must be the hand of the Supreme Personality of Godhead. Similarly, a father’s and mother’s taking care of their children is not the cause of the children’s comfort. Sometimes it is found that in spite of all care by the parents, the children go bad or succumb to death. Therefore material causes are not sufficient for results. There must be the sanction of the Supreme Personality of Godhead. Nanda Maharaja therefore advocated that in order to get good results for agricultural activities, they must satisfy Indra, the superintending deity of the rain supply. Lord Krishna nullified this argument, saying that the demigods give results only to persons who have executed their prescribed duties. The demigods cannot give any good results to the person who has not executed the prescribed duties; therefore demigods are dependent on the execution of duties and are not absolute in awarding good results to anyone. So why should one care about them? Krishna identified Himself with the vaisya community because Nanda Maharaja was protecting many cows and Krishna was taking care of them. He enumerated four kinds of business engagements for the vaisya community, namely agriculture, trade, protection of cows and banking. Although the vaisyas can take to any of these occupations, the men of Vrindavana were engaged primarily in the protection of cows. In this statement, Lord Krishna practically described the whole economy of the vaisya community. In all communities in human society—including the brahmanas, kshatriyas, vaisyas, sudras, candalas, etc.— and in the animal kingdom—including the cows, dogs, goats, etc.—everyone has his part to play. Each is to work in cooperation for the total benefit of all society, which includes not only animate objects but also inanimate objects like hills and land. The vaisya community is specifically responsible for the economic improvement of the society by producing grains, by giving protection to the cows, by transporting food when needed, and by banking and finance. From this statement we learn also that although the cats and dogs, which have now become so important, are not to be neglected, cow protection is actually more important than protection of cats and dogs. Another hint we get from this statement is that the candalas, or the untouchables, are also not to be neglected by the higher classes and should be given necessary protection. Everyone is important, but some are directly responsible for the advancement of human society and some are only indirectly responsible. However, when Krishna consciousness is there, then everyone’s total benefit is taken care of. The sacrifice known as Govardhana-puja is observed in the Krishna consciousness movement. Lord Caitanya has recommended that since Krishna is worshipable, so His land—Vrindavana and Govardhana Hill—is also worshipable. To confirm this statement, Lord Krishna said that Govardhana-puja is as good as worship of Him. From that day, Govardhana-puja has been going on and is known as Annakuta. In all the temples of Vrindavana or outside of Vrindavana, huge quantities of food are prepared in this ceremony and are very sumptuously distributed to the general population. Sometimes the food is thrown to the crowds, and they enjoy collecting it off the ground. From this we can understand that prasadam offered to Krishna never becomes polluted or contaminated, even if it is thrown on the ground. The people, therefore, collect it and eat with great satisfaction. The Supreme Personality of Godhead, Krishna, therefore advised the cowherd men to stop the Indra-yajna and begin the Govardhana-puja in order to chastise Indra, who was very much puffed up at being the supreme controller of the heavenly planets. The honest and simple cowherd men, headed by Nanda Maharaja, accepted Krishna’s proposal and executed in detail everything He advised. They performed Govardhana worship and circumambulation of the hill. (Following the inauguration of Govardhana-puja, people in Vrindavana still dress nicely and assemble near Govardhana Hill to offer worship and circumambulate the hill, leading their cows all around.) According to the instruction of Lord Krishna, Nanda Maharaja and the cowherd men called in learned brahmanas and began to worship Govardhana Hill by chanting Vedic hymns and offering prasadam. The inhabitants of Vrindavana assembled together, decorated their cows and gave them grass. Keeping the cows in front, they began to circumambulate Govardhana Hill. The gopis dressed themselves very luxuriantly and sat in bull-driven carts, chanting the glories of Krishna’s pastimes. Assembled there to act as priests for Govardhana-puja, the brahmanas offered their blessings to the cowherd men and their wives, the gopis. Thus performing the Govardhana-puja sacrifice, all the inhabitants of Vrindavana followed the instructions of Krishna, the son of Vasudeva, and afterwards they returned to their respective homes. by His Divine Grace A. C. Bhaktivedanta Swami Prabhupada. Krishna has declared in the Bhagavad-gita that the worshipers of the demigods are not very intelligent. He has also declared that one has to give up all kinds of worship and simply concentrate on Krishna consciousness. Krishna’s invoking the anger of Indra and later on chastising him is a clear indication to His devotees that those who are engaged in Krishna consciousness have no need to worship any demigod, even if it is found that the demigod has become angry. Krishna gives His devotees all protection, and they should completely depend on His mercy. Indra cursed the action of the inhabitants of Vrindavana and said, “By defying the authority of the demigods, the inhabitants of Vrindavana will suffer in material existence. Having neglected the sacrifice to the demigods, they cannot cross over the impediments of the ocean of material existence.” Indra further declared, “These cowherd men in Vrindavana have neglected my authority on the advice of this talkative boy who is known as Krishna. He is nothing but a child, and by believing this child, they have enraged me.” Thus he ordered the Samvartaka cloud to go and destroy the prosperity of Vrindavana. “The men of Vrindavana,” said Indra, “have become too puffed up over their material opulence and are overconfident due to the presence of their tiny friend, Krishna. He is simply talkative, childish and unaware of the complete cosmic situation, although He is thinking Himself very advanced in knowledge. Because they have taken Krishna so seriously, they must be punished. They should be destroyed with their cows.” In this way Indra ordered the Samvartaka cloud to go to Vrindavana and inundate the place. Thinking in this way, Lord Krishna immediately picked up Govardhana Hill with one hand, exactly as a child picks up a mushroom from the ground. Thus He exhibited His transcendental pastime of lifting Govardhana Hill. Lord Krishna then addressed His devotees, “My dear brothers, My dear father, My dear inhabitants of Vrindavana, you can now safely enter under the umbrella of Govardhana Hill, which I have just lifted. Do not be afraid of the hill and think that it will fall from My hand. You have been too much afflicted from the heavy rain and strong wind; therefore I have lifted this hill, which will protect you exactly like a huge umbrella. I think this is a proper arrangement to relieve you of your immediate distress. Be happy along with your animals underneath this great umbrella.” Being assured by Lord Krishna, all the inhabitants of Vrindavana entered beneath the great hill along with their property and animals, and they all appeared to be safe. All the men loaded their valuables on carts and slowly left with their cows and other paraphernalia. After they had cleared out everything, Lord Krishna very slowly replaced Govardhana Hill exactly in the same position as it had been before. When everything was done, all the inhabitants of Vrindavana approached Krishna with feelings of love and embraced Him with great ecstasy. The gopis, being naturally very affectionate to Krishna, began to offer Him yogurt mixed with their tears, and they poured incessant blessings upon Him. Mother Yasoda, mother Rohini, Nanda and Balarama, who is the strongest of the strong, embraced Krishna one after another and, from spontaneous feelings of affection, blessed Him over and over again. In the heavens, different demigods from different planetary systems, such as Siddhaloka, Gandharvaloka and Caranaloka, also began to show their complete satisfaction. They poured showers of flowers on the surface of the earth and sounded different conchshells. There was beating of drums, and being inspired by godly feelings, residents of Gandharvaloka began to play on their tambouras to please the Lord. After this incident, the Supreme Personality of Godhead, surrounded by His dear friends and the animals, returned to His home. As usual, the gopis began to chant the glorious pastimes of Lord Krishna with great feeling, for they were chanting from the heart. pita-mata—father and mother; mari’—killing; khao—you eat; eba—this; kon—what kind of; dharma—religion; kon bale—on what strength; kara—do; tumi—you; e-mata—such; vikarma—sinful activities. Everyone can understand that we drink the milk of cows and take the help of bulls in producing agricultural products. Therefore, since our real father gives us food grains and our mother gives us milk with which to live, the cow and bull are considered our father and mother. According to Vedic civilization, there are seven mothers, of which the cow is one. Therefore Sri Caitanya Mahaprabhu challenged the Muslim Kazi, “What kind of religious principle do you follow by killing your father and mother to eat them?” In any civilized human society, no one would dare kill his father and mother for the purpose of eating them. Therefore Sri Caitanya Mahaprabhu challenged the system of Muslim religion as patricide and matricide. In the Christian religion also, a principal commandment is “Thou shalt not kill.” Nevertheless, Christians violate this rule; they are very expert in killing and in opening slaughterhouses. In our Krishna consciousness movement, our first provision is that no one should be allowed to eat any kind of flesh. It does not matter whether it is cows’ flesh or goats’ flesh, but we especially stress the prohibition against cows’ flesh because according to sastra the cow is our mother. (A.C. Bhaktivedanta Swami Prabhupada. Sri Chaitanya Charitamrta Adi-lila 17:154. text and purport). “According to the Vedic social system, as soon as one takes birth he becomes indebted to so many persons. We are indebted to the rishis, or great sages, because we derive knowledge from their transcendental writings, such as the Srimad-Bhagavatam, compiled by Srila Vyasadeva. The authors of the scripture know past, present, and future, and we are urged to take advantage of such invaluable knowledge. Thus we are indebted to the sages. We are also indebted to the demigods, for they manage the affairs of the universe, supplying it with every essential—sunshine from the sun-god, Surya; moonshine from the moon-god, Candra; air from Vayu; and so on. Each element is controlled by a particular demigod. Actually, Hindu is not a religion. Hindu is a name given by the foreigners. The religion is, of India, varnasrama-dharma, following the institution of four varnas and four asramas. That is varn… Or sanatana-dharma. Sanatana-dharma means eternal, eternal religion. Religion of human being is one. That is called sanatana. A living entity is described as sanatana. Mamaivamso jiva-bhuto jiva-loke sanatanah. In the Bhagavad-gita you’ll find sanatanah, and Krishna is also addressed in the Eleventh Chapter as sanatanas tvam. And there is another place, or spiritual world, which is also called sanatana. In the Bhagavad-gita you’ll find, paras tasmat tu bhavo ’nyo ’vyakto ’vyaktat sanatanah. So this sanatana term is very important. The living entity is sanatana and God is sanatana and the spiritual world is sanatana, and the process by which your lost relationship with God established and you go back to home back to Godhead, that is called sanatana-dharma. Sanatana-dharma. That is our eternal relationship with God.” (A.C. Bhaktivedanta Swami Prabhupada. 15th January 1974. Srimad Bhagavatam lecture SB 1:16:19. Hawaii). Govardhana Puja triggered one of the most known and beautiful of Krishna’s pastimes. More information, photos and videos on Govardhana in our Archive. By subscribing you help us in our researches to offer you always more and better.